NEW FORMULA Shen Min Advanced Women's Formula is synergistically formulated to naturally enhance a woman's hair growth, strength and vitality, resulting in thicker, stronger hair and follicles. This latest version of the Shen Min Women's line has been formulated to maximize hair regrowth and reduce hormone-driven & age related hair loss. An integrated and revolutionary combination of Traditional Chinese Medicine and modern science has come together to create the latest breakthrough in achieving full, lustrous, healthy hair. 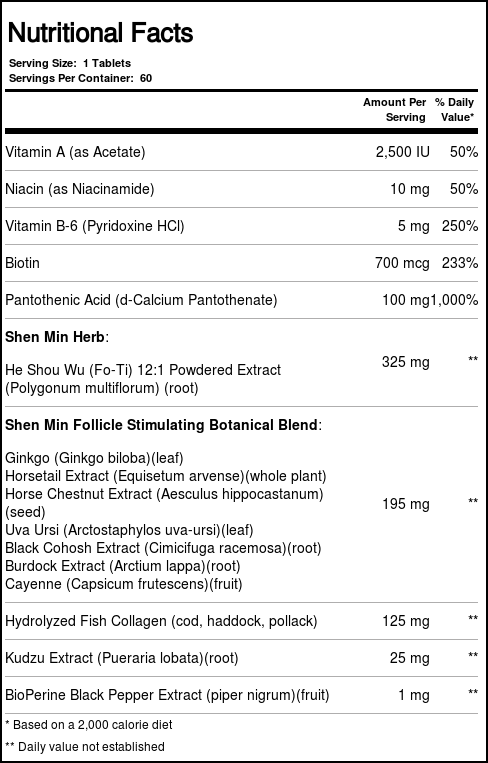 By combining a powerful mixture of "standardized" herbs such as He Shou Wu & Horse Chestnut Extract with vital co-factor nutrients such as Silica, Biotin, & more, Shen Min's Advanced Women's Formula helps to maximize hair's potential naturally! For added effectiveness, phytonutrient herbal compounds have been included, plus Bioperine, which has been shown to enhance the bioavailability of other active plant compounds. Shen Min Advanced Women's Formula promotes healthy hair Naturally! Warnings: Always consult your physician before taking any nutritional product. Do not exceed recommended daily intake. Notes: This product does NOT contain: Sugar, Artificial Colors, Preservatives, Gluten, Soy, Sodium or Yeast. Recommended Use: As a dietary supplement, take (1) tablet, two times daily, with a meal. For best results, this product should be taken for a minimum of 3 to 4 months. 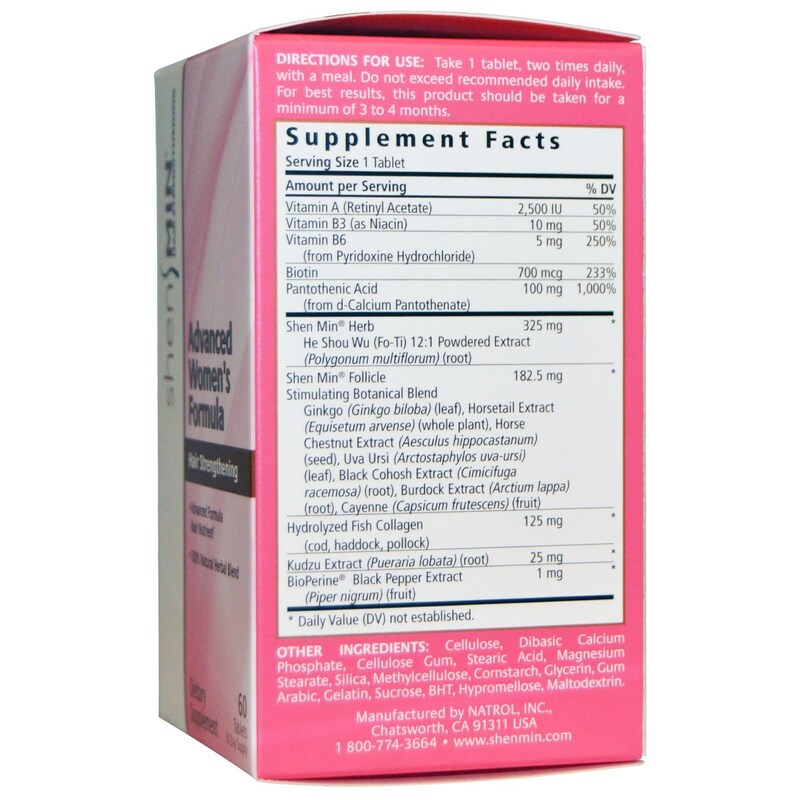 The customer reviews posted below are based on individual consumer experiences and may NOT necessarily represent what expected results will be from using or taking Bio-Tech Shen Min Advanced Women's Formula - 60 Tablets. These results may not be typical and you should not necessarily expect to receive the same results. Actual results may vary. It might be my optimism, but I am so glad I got this product. Initially, there was a mix-up in the product I received and then I found out there had been a formulation change. However, the e-vitamin Customer Service Rep was extremely helpful in identifying the differences in the former product and what they currently stock. She even suggested that I contact the manufacturer, which I did to confirm and felt even better about what she said. Again, great customer support e-vitamins! Shen Min is the best hair vitamin I have ever tried. I had results after 2 months of using it. I will never stop using it because of the perfect results I got. I was recently diagnosed with PCOS (poly cystic ovarian syndrome) and lost more than half of my long dark hair. I had tried this product about a year ago and noticed great results! 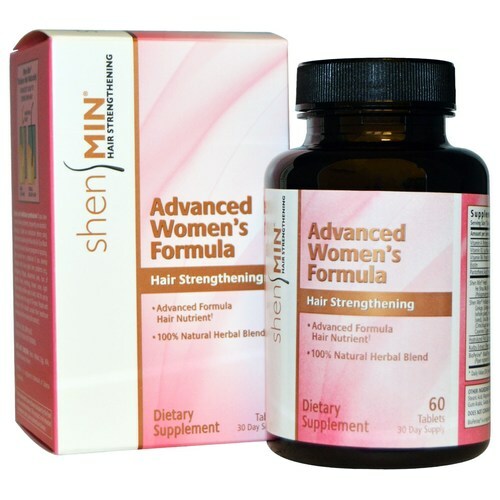 My hair began to grow and became fuller within three months of taking Shen Min Advanced Women's Formula vitamins daily. It also contains biotin and saw palmetto which were highly recommended by my dermatologist. My hair will never be the same as it was 5 years ago but at least I won't be a 24 year old bald chick walking around with a hat. I give this product an excellent rating. I have been suffering from "hot comb alopecia" which is a form of follicular degeneration (hair loss) that in some causes cannot be reversed. After 4 years of visiting multiple Dermatologists and using other multivitamins, a Trichologist (hair doctor) recommended this product and within a month and a half of use, I can see significant results. The inflammation and thinning along my hairline is gone! This product along with a healthy diet, exercise, and a good all natural deep cleansing shampoo have significantly reduced my hair loss. Finally! I hope it works for you. God Bless! Just to let you know that I have been using Shen Min Advance Formula For Women for a month, and my hair is the healthiest it has ever been. I notice that my hair is darker, fuller, and growing faster than ever since taking Shen Min. Great product! I will definitely re-order. By the way, I would like to also let you know that your customer service is absolutely wonderful.